Today, more and more people are moving into forested areas and many natural resources, like trees and minerals, are increasingly in demand. As a result, it is becoming harder for many wildlife species, including Harpy Eagles, to find good areas in which to live. In Central America, the loss of Harpy Eagles was particularly noticed as the species became extinct in countries such as El Salvador and began disappearing quickly from others, such as Mexico and Costa Rica. 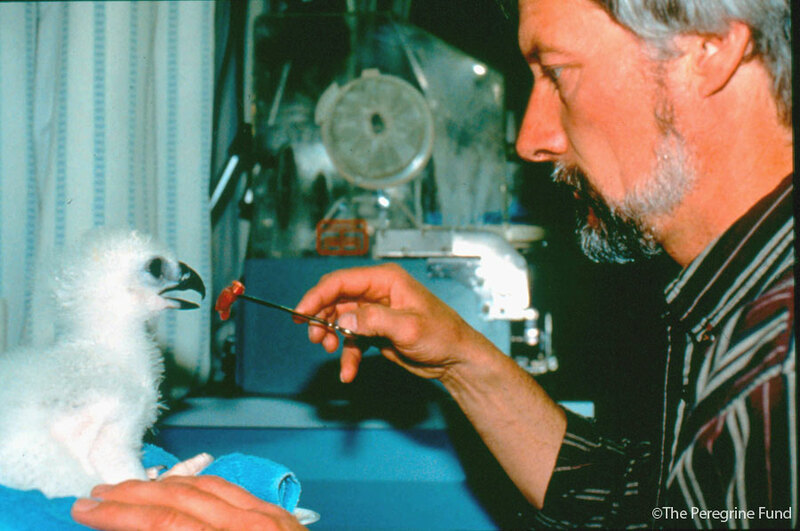 In 1989 The Peregrine Fund began a program to learn how to breed Harpy Eagles in captivity and to return the species to some of its rain forest habitat. With the cooperation of many Latin American countries such as Panama, Ecuador and Venezuela, which donated eagles from their national zoos and similar facilities, The Peregrine Fund had enough Harpy Eagles to begin a captive breeding program. The adult eagles were all sent to The Peregrine Fund’s headquarters in Boise, Idaho. Boise is much colder and drier than the places where most Harpy Eagles live. To help make the birds feel at home and thus more likely to breed, The Peregrine Fund built special chambers designed to mimic some of the conditions of a natural rain forest. 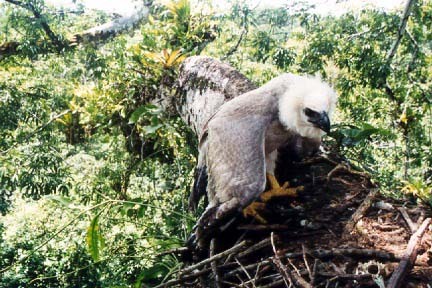 Despite all these efforts, however, only 10 Harpy Eagle chicks survived to hatching in about seven years. Our biologists realized that to achieve the highest production possible, the eagles needed to be in an area more consistent with their natural habitat, which would include an outdoor area with warmer temperatures, higher humidity, and adequate sunlight. 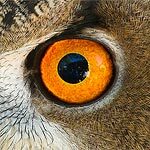 The commitment to creating a more productive captive population of Harpy Eagles was realized with the construction of the Neotropical Raptor Center and captive breeding facility in Panama City, Panama, in 2001. At the new facility, 17 eagles hatched in the first year alone! 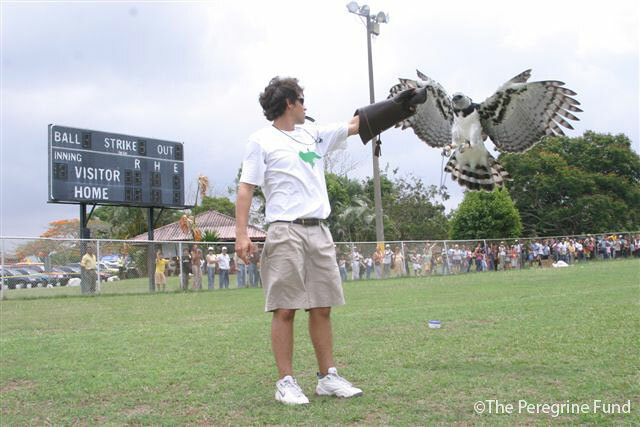 Almost 50 Harpy Eagles have been released in Panama and Belize since 1998. The captive breeding phase ended in 2006 and the last captive birds were released in 2008. Through this effort, The Peregrine Fund gained valuable knowledge and experience that will be useful in ensuring the survival of this and other large, tropical forest raptors. While the release program was in full swing, The Peregrine Fund also carried out an extensive education campaign designed to teach people that Harpy Eagles aren’t dangerous and that they should be protected. Peregrine Fund educators conducted talks at schools and in communities, held teacher training workshops, produced radio messages and commercial jingles, and hosted festivals. All of this helped to change people’s attitudes toward this beautiful eagle. With some help from us, the country of Panama declared the Harpy Eagle as its national bird on April 10, 2002! 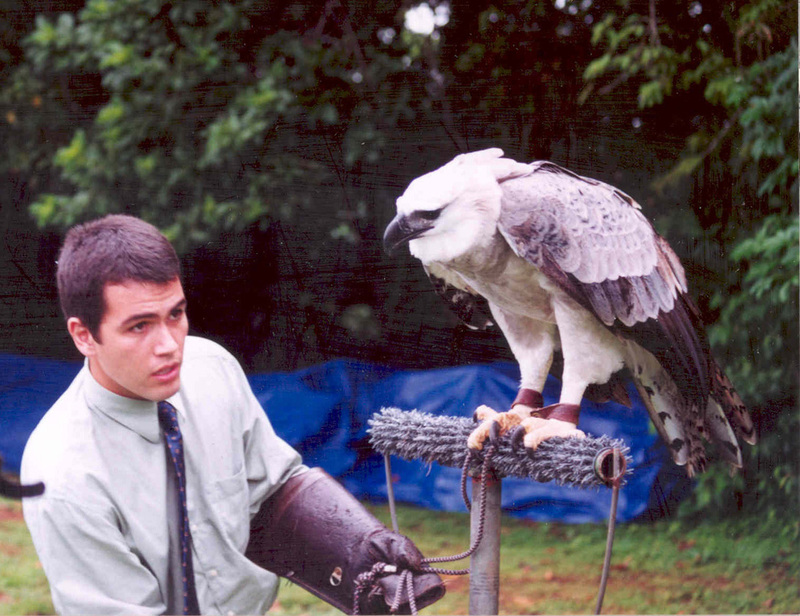 A big part of The Peregrine Fund’s education campaign was made possible due to a Harpy Eagle named Luigi. Luigi hatched in Boise and traveled to schools and communities in Panama. He helped teach people that Harpy Eagles are gentle birds and deserve to be protected. Luigi was retired in 2013 and moved to Florida. 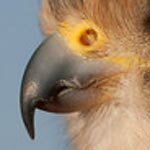 Today, the Peregrine Fund supports one of the longest studies on Harpy Eagles ever. For more than 10 years, biologists have been observing the wild population in Darien, Panama. Every day, they learn more and more about this eagle’s diet, habitat needs, nesting behavior, and other interesting facts. 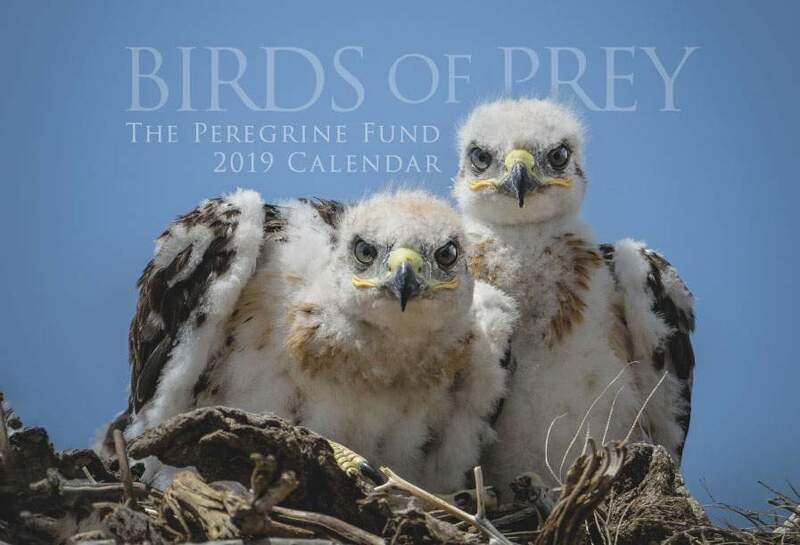 This information will help The Peregrine Fund and other organizations better determine how to protect Harpy Eagles and increase their numbers. Historically, Harpy Eagles were found from southern Mexico through Central and South America all the way down to northern Argentina. Sadly, Harpy Eagles are disappearing mainly because people are destroying their habitat and shooting them. In Central America, the largest known breeding population is found in Panama, close to the border with Colombia. 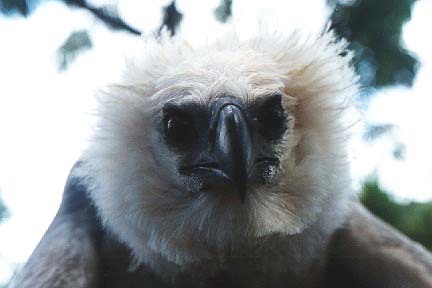 Harpy Eagles are likely extinct in El Salvador. Only one nesting pair has been observed in Belize. 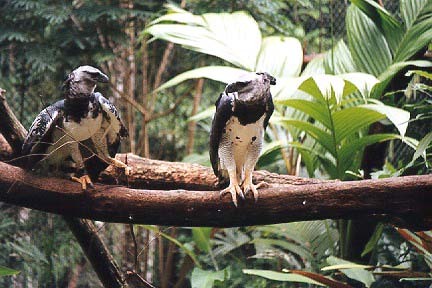 Like the Ornate Hawk-eagle, the Harpy Eagle is a Neotropical rainforest species. It lives at low elevations where it can find prey and large trees for nests. Its rainforest home is lush and vibrant and contains some of the highest biodiversity in the world. 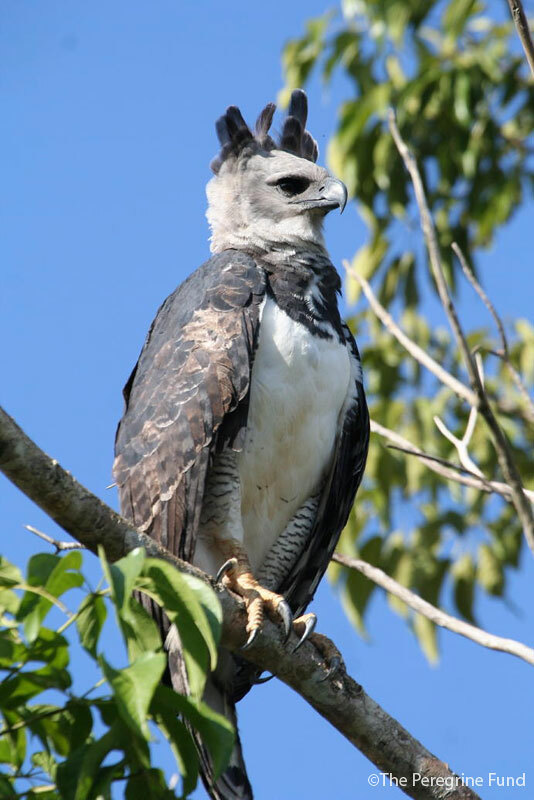 The Harpy Eagle lives among jaguars, macaws, tapir, monkeys, sloths, snakes, frogs, and many other plants and animals – each one playing an important role in its environment. While these eagles prefer large expanses of pristine forest, Peregrine Fund biologists have learned that they can survive in some habitats that have been altered by humans as long as there is enough to eat, they have tall trees to nest in, and people don’t harm them. Imagine a large, forest-dwelling bird with legs almost as thick as your wrists. Imagine a bird able to hunt heavy sloths or monkeys with nothing but the strength of its claws, toes and legs. Imagine a bird that might mate for life and that shares all parenting duties. Imagine a bird that cares for its chick for up to the first two years of its life. If you can imagine a bird with all these characteristics, you can imagine a Harpy Eagle. Harpy Eagles are among the most powerful raptors in the world. From wing tip to wing tip, they are longer than many full-grown humans are tall. Unlike the Andean Condor and many other raptors, Harpy Eagles are not built for true soaring. They have relatively short wings and long tails that act like a rudder on a boat to steer through dense vegetation. Rather than flying long distances at one time, Harpy Eagles travel relatively slowly, moving from tree to tree through the forest. Harpy Eagles are diurnal (active in the daytime) and spend much of their time perched in high trees when they are not actively hunting or searching for food. When they are hunting, they sometimes drop below the forest canopy to look for prey. Even in the daytime, little sunlight penetrates the thick forest and it is a lot darker there than it would be in the open. So, in addition to their keen eyesight, Harpy Eagles use their hearing to help them pinpoint prey. They are one of the few diurnal raptors that have a facial disk, a trait they share with owls. The facial disk is composed of feathers that form a circle around the bird’s face. The disk can be lifted or lowered at will. When the feathers of the facial disk are raised, they help direct sounds to the birds’ ears, which are located on the sides of its head. To find out how this works, cup your hands behind your ears and listen. You might notice that whatever you are listening to seems louder. These eagles also have a crest composed of a few long feathers that also can be raised and lowered at will. Harpy Eagles don’t hunt every day, as they can feed on the same kill for several days in a row. Now, if you think that a dead animal must get fairly stinky after three days in the heat of a Neotropical forest, you are right! Harpy Eagles don’t have containers or cool places to store their food like we do, but their bodies have a higher tolerance for eating meat that is several days old and slightly rotten. Though it may sound gross, this helps Harpy Eagles survive and means that they have to hunt less. Unlike many raptors, they do not need to eat every day. In fact, they can go a week or more without food! Harpy Eagles, like all top predators, play a very important role in their environment. They are what is known as an umbrella species. Just as several people can stand under a large umbrella and be protected from the rain, so too can many species of wildlife be protected by conserving one species like the Harpy Eagle. To protect the eagles, we must protect the monkeys and sloths and other animals they need for food, the plants and animals that monkeys and sloths feed on, and the trees that Harpy Eagles nest in, which helps protect the other animals that use these trees for food, shelter, and space. Conserving Harpy Eagles and their habitat automatically provides protection for all the other plants and animals that live there too. It might seem that a bird as big and as strong as a Harpy Eagle would not need our help, but the truth is that large animals, especially predators, are sometimes the ones that become endangered first. Many large predators have a hard time surviving in today’s world because they usually need more habitat and space in which to survive, they rely on other animals for food, and many people fear them and sometimes kill them. The Harpy Eagle is no exception. When forests are cut down, many of the animals who once lived there are forced to move. With less and less available forest, there often isn’t enough habitat to support all the wildlife that needs a home. Many end up dying. Others are forced to live on forest edges, which puts them at greater risk of being harmed by people. 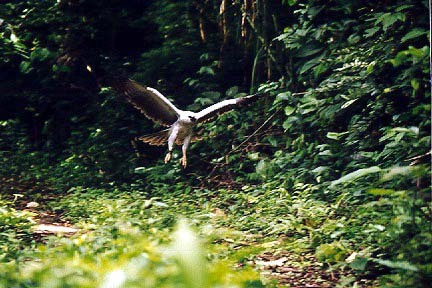 In 2002, The Peregrine Fund did a survey in Panama to find out why people might kill a Harpy Eagle. The top answers all were related to a misunderstanding about the bird’s behavior. Sometimes people were afraid the eagles would attack them or their families. Others were just curious and wanted to see a bird up close. 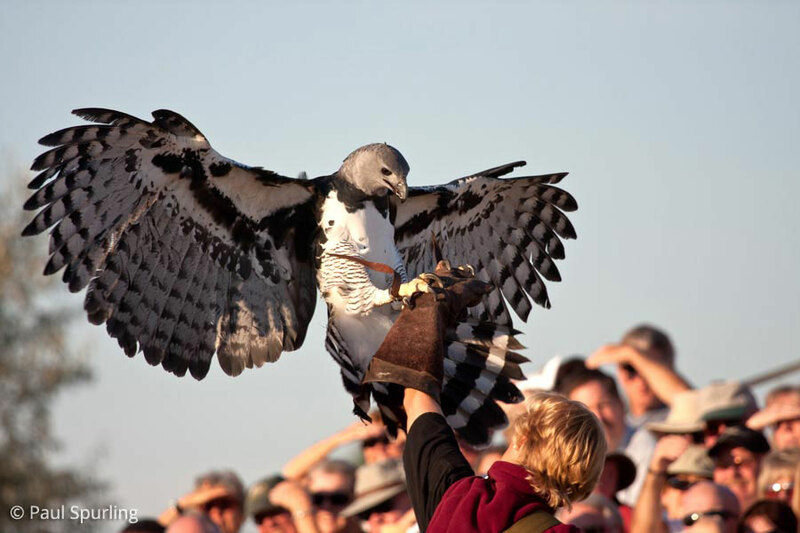 Through research and education, The Peregrine Fund continues to support Harpy Eagle conservation. A raptor’s feet determine what it eats. One look at a Harpy Eagle’s foot leaves no doubt that these birds are built for hunting good-sized prey. Their powerful legs and feet and long, sharp talons are designed to catch prey that would be off-limits for most other birds. Two-foot-long Howler Monkeys (not including their tails), 8-pound sloths, even baby deer are all on this eagle’s menu. Harpy Eagles have a varied diet. They are able to fly between trees and branches with amazing agility for their great size and are skilled at catching arboreal animals, or animals that spend all or much of their lives in trees. This can include iguanas, parrots, porcupines, coatimundis, and raccoons. They have even been seen preying on Black Vultures and foxes! Though they prefer to hunt high up the trees, they will hunt ground dwelling animals, including javelina, armadillos, and agoutis. Even though Harpy Eagles are adapted to hunting large prey animals, they still have to be very careful. After all, it isn’t only the predators that are equipped with good defenses. Monkeys and sloths, for example, have sharp teeth and claws. With one swipe or bite, they could easily injure any predator. 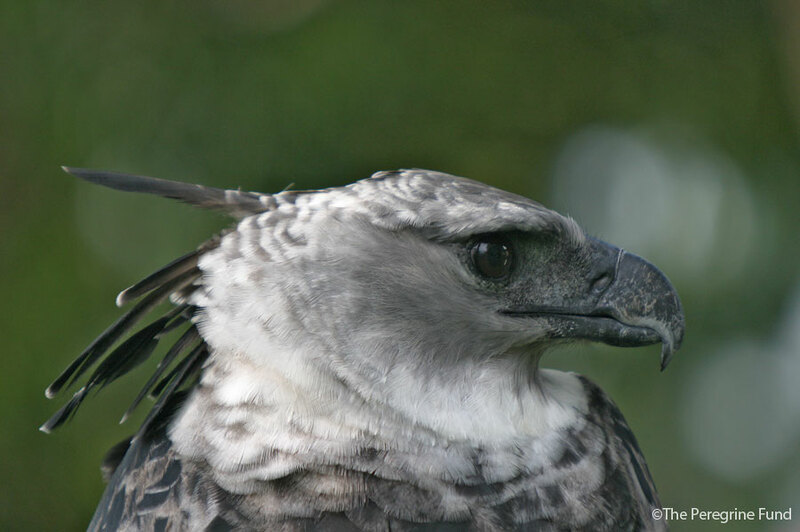 Peregrine Fund biologists once found a Harpy Eagle with a large, deep cut on his left leg. They suspected that he had been hurt by a prey animal defending itself. 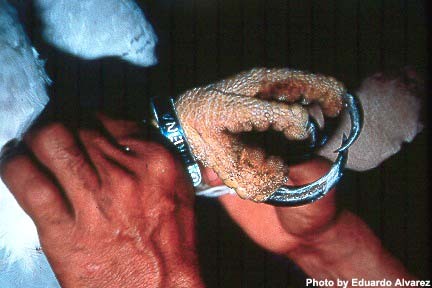 Luckily, the biologists were able to treat the bird and release it. Younger birds, in particular, are susceptible to injury while they are learning how to become effective hunters. Harpy Eagles reach adulthood when they are about 5 years old. A young bird’s feathers are almost all white and light grey. At least once a year, all birds go through molt, when their old feathers fall out and are replaced by new ones. For the first five years, a young Harpy Eagle's feathers grow in a little darker after each molt. When it reaches adulthood, the bird continues to molt but its feathers no longer change color. 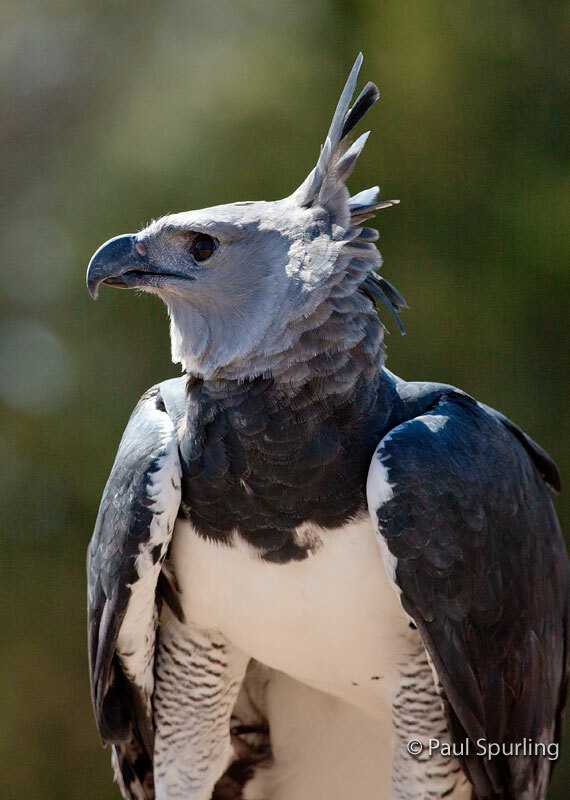 Adult Harpy Eagles have black back feathers, a dark grey face, and white belly feathers. This coloration could help Harpy Eagles identify other members of their species who are ready to mate. For an adult Harpy Eagle, finding a mate and raising young are very important. Scientists believe that Harpy Eagles may stay with the same companion for life. This means that a male and a female could stay together for 25-30 years! After a suitable partner is found, it is time to look for a nesting site. 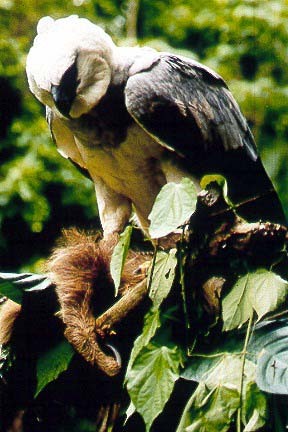 Harpy Eagles nest in some of the tallest trees in the forest. They pick the highest point on the trunks of these trees, just where the branches begin to spread out, at around 130 feet or 40 meters high. Once they pick the tree, nest building begins. Nests are composed of large sticks and branches gathered from nearby trees. When a Harpy Eagle locates an adequate branch, it will clutch it in its mighty talons, all the while flapping its wings vigorously until the branch breaks off the tree. It then carries the branch back to the host tree and arranges it in the ever-growing nest. In all, the pair will lay down more than 300 branches! The result is a nest that can be 6 feet in diameter and more than 1 foot deep. Two grown men fit easily into a Harpy Eagle nest. Some Harpy Eagle pairs reuse the same nest over and over, while others might have several nests they use off and on over the years. When the nest is completed, the female will lay one or two large white eggs. Though the male may assist in incubation, the female does the most sitting on the eggs to keep the chicks developing inside warm and safe. She needs to incubate her eggs for approximately 55 days. Imagine sitting in the same spot for almost two months straight, only taking occasional breaks to stretch your wings or to eat. It is not an easy task, but Harpy Eagle mothers do it with ease. Even so, most often only one chick out of the two eggs will survive. Though scientists don’t fully understand why, some believe that Harpy Eagles lay the second egg as a “backup” in case something happens to the first. And since raising one Harpy Eagle chick takes so much time and energy, it would be too difficult to try to raise two chicks. Therefore, scientists believe that once the first chick hatches, the female stops incubating the second egg. If an egg isn’t incubated, the chick inside isn’t able to develop and hatch. If, for some reason, the first egg doesn’t hatch, the pair has another chance to raise young from the second egg. Harpy Eagles are wonderful parents that work hard to protect their chicks. From the time the female first lays her eggs until the nestling is about 4 months old, she will spend almost all her time at the nest. Meanwhile, the male spends his time and energy looking for food for himself, the female, and his young. 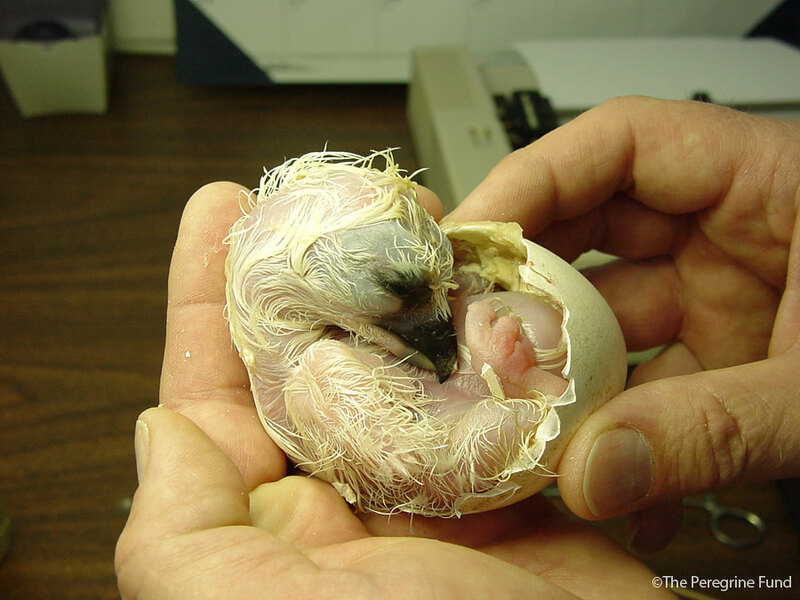 A newly hatched Harpy Eagle chick is so small that it fits perfectly into the palm of a person’s hand. In only 5-6 months, though, it will reach adult size! Because the chick grows so quickly, it needs to eat a lot and it needs to eat often. When the chick is very young, the mother will tear off small pieces of meat for the chick and delicately feed it with her bill. Later, as the chick grows, it will be able to tear off and eat the meat on its own. At around 5-6 months of age, the young eagle will fledge, or fly for the first time. Its first few flights might be shaky and awkward, but after only a few days, it will be flying almost as well as its parents. The young bird will remain dependent on the adults for the first one to two years of life. When it is hunting well enough on its own, the juvenile will disperse, or leave its parents' territory and look for a home of its own. When a young bird turns 4 or 5 years old, it will begin looking for a partner and the cycle of reproduction will begin all over again. A pair of Harpy Eagles generally raises young every two years. They normally won’t lay more eggs while they are still caring for a young bird in their territory. Harpy Eagles are a Neotropical species, which means they won't be found living in the forests or deserts of Idaho. Even so, Idaho is an important state for this species. 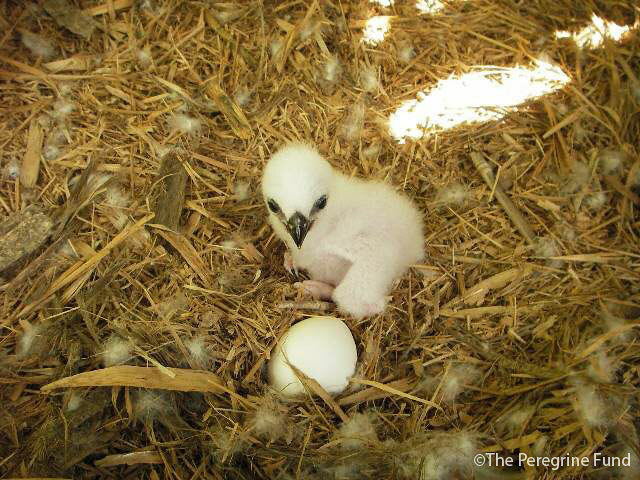 At The Peregrine Fund's captive breeding facilities, 10 Harpy Eagles were hatched and raised in the late 1990s. These young were later released into their native habitat in Panama. 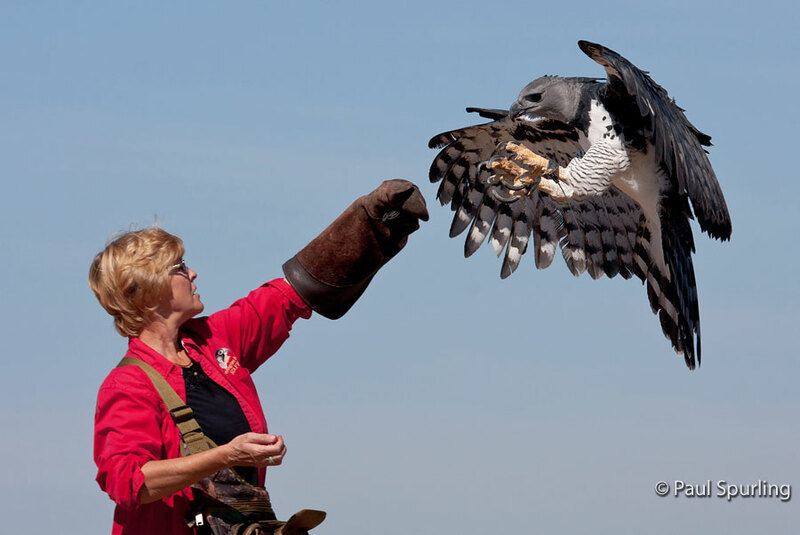 The World Center for Birds of Prey is a great place to begin learning about Harpy Eagles. We have a mounted eagle on display, real Harpy Eagle feathers you can touch, and a short video that chronicles the exciting journey of our biologists as they work to hatch young eagles, raise them, and ultimately release them into the dense forests of Panama.